Garden of Aaron: Learning from Cheekwood - Mahonia, Dianthus, Abelia, Ajuga, Aucuba, Baptisia, Lantana, Salvia, Vitex and more! Learning from Cheekwood - Mahonia, Dianthus, Abelia, Ajuga, Aucuba, Baptisia, Lantana, Salvia, Vitex and more! I love visiting botanic gardens when I travel. It's always fun to see the variety of plants that can grow in an environment very different from the one where I live. But it's equally pleasurable - and in some ways probably more useful - to visit a botanic garden close to home. The plants growing in your hometown botanic garden probably face many of the same growing conditions - heat, cold, rain, drought, soil, wind, etc. 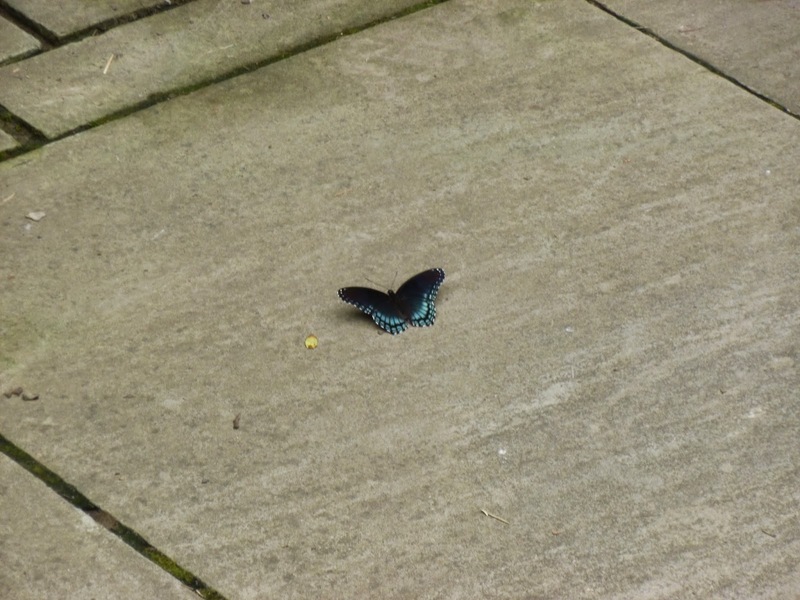 - that you encounter in your own backyard. Abelia x grandiflora with bee. I've been toying with the idea of adding some of these to my landscape for their reputed toughness, long flowering season and ability to attract bees and butterflies. I don't remember what the foliage on this plant looked like when I visited Cheekwood in wintertime (it can be evergreen, semi-evergreen or deciduous depending on the climate), but it looks gorgeous now. 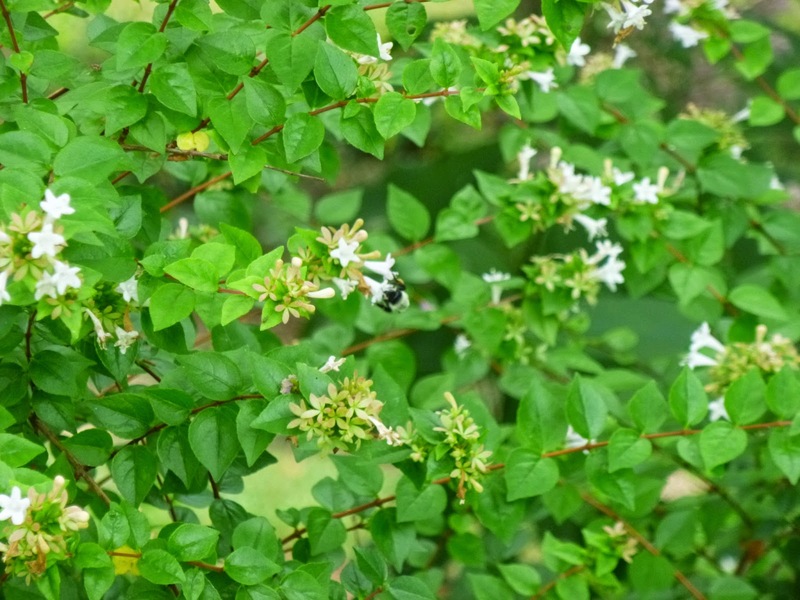 And I've got photographic proof that at least one bumblebee likes Glossy Abelia! 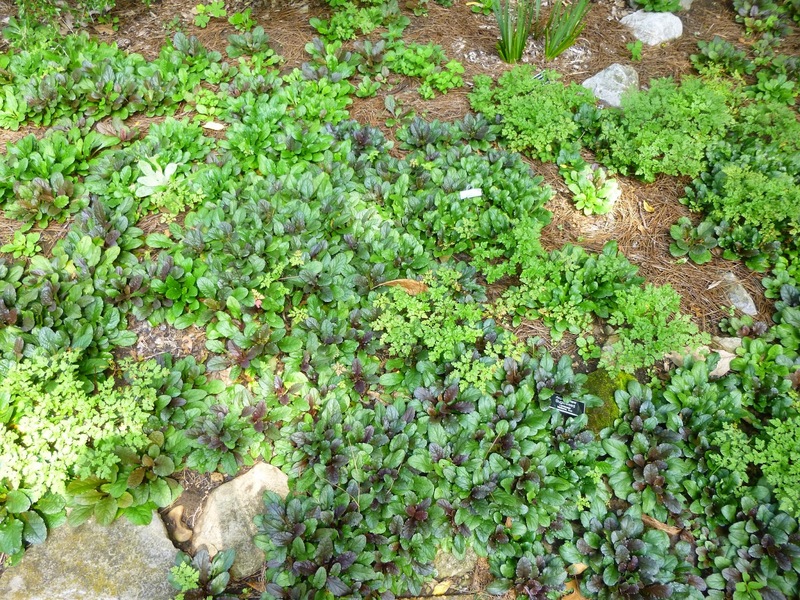 No sign on this groundcover, but I think it is Ajuga tenorii "Chocolate Chip", a thin-leaved Ajuga species that gets great reviews on the Dave's Garden website. Looks like it should do a pretty decent job as a weed-blocker -- plus gotta love those spring Ajuga flowers! 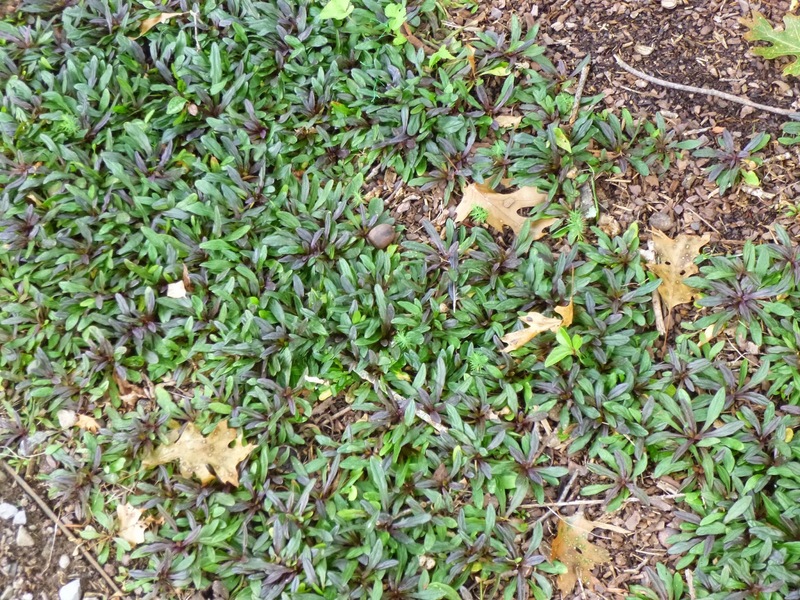 Ajuga reptans. The sign didn't list a cultivar, so perhaps this is the straight species. Not sure about the other lighter green plants in the mix. Baptisia australis, Blue False Indigo, a Tennessee native looking healthy, happy and bushy. From my own experience, this is a tough, beautiful plant. I love plants whose foliage looks beautiful from spring through frost. You can see this perennial gets pretty big and bushy, so stand back and give it some room! 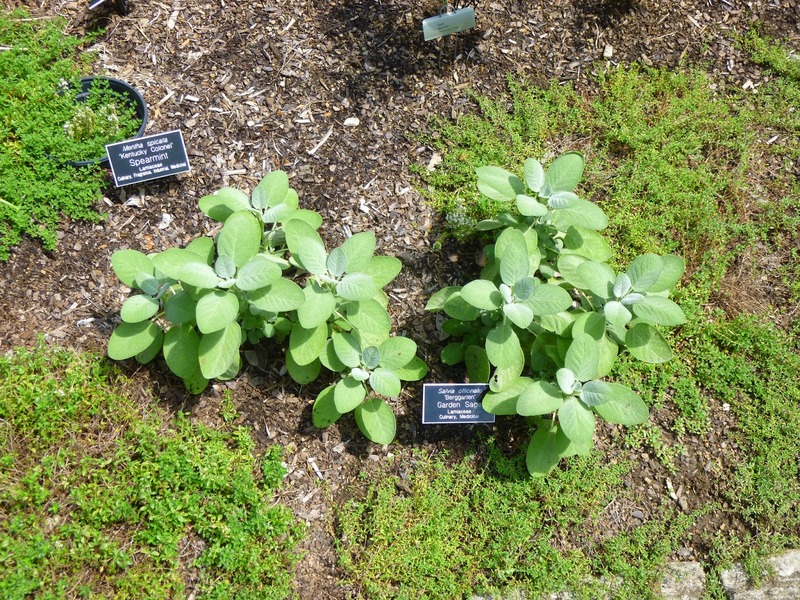 Salvia officinalis "Berggarten", Garden Sage, I tried growing this one year in a pot and it was not happy. But then again, I'm quite a bumbling container gardener. Perhaps I need to give Berggarten a fighting chance by planting it in garden soil? Not terribly exciting looking, but this Blue-Eyed Grass certainly looks healthy. I'd just have to make sure that I didn't mistake it for a weed and shovel prune it accidentally! Some sort of Camellia. 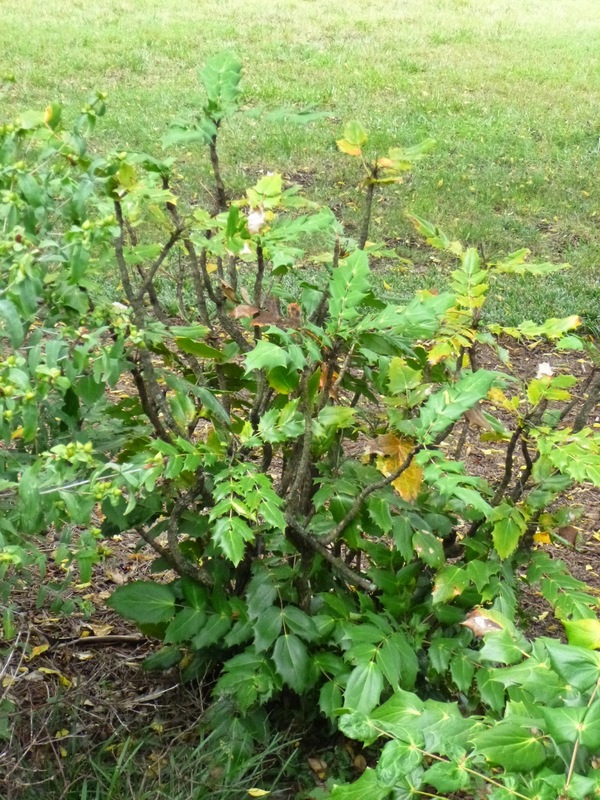 The pruning indicates to me that this young bush suffered some dieback in the 2013-14 winter. Not too surprised as all my camellias - especially the younger ones - suffered damage last winter. Two were killed outright and another was killed back to within a foot of the ground. 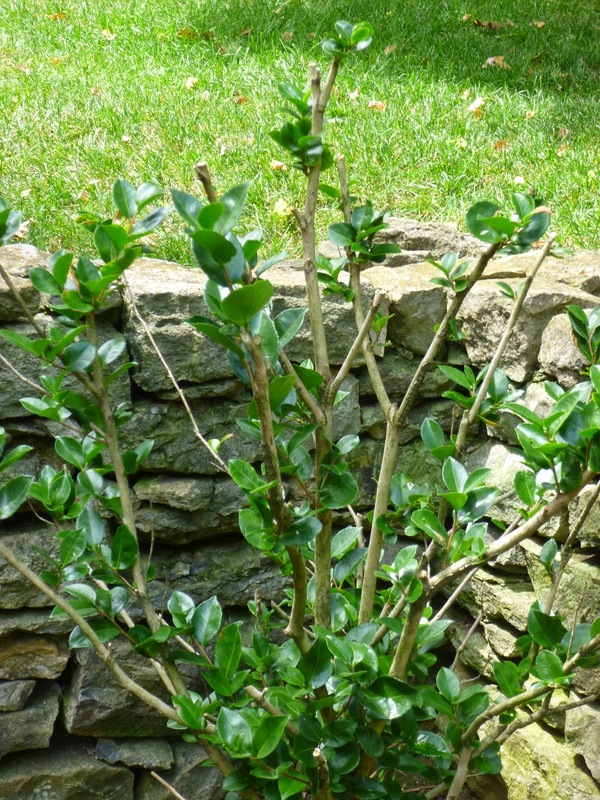 In my personal experience, it's dicey trying to grow Camellias in Middle Tennessee, even in protected microclimates. Capsicum annuum, Pepper! 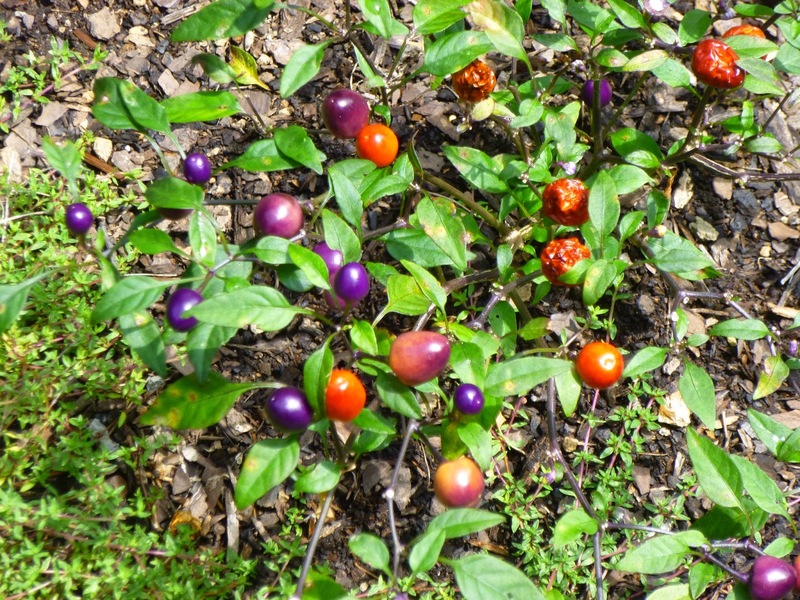 These plants are very low-growing -- probably not more than 6-inches tall -- but I have to say the vibrant colors and gumball shape of the pepper fruits makes them very eye-catching. Not sure whether all peppers are edible, but these look as though they're just supposed to be ornamental. 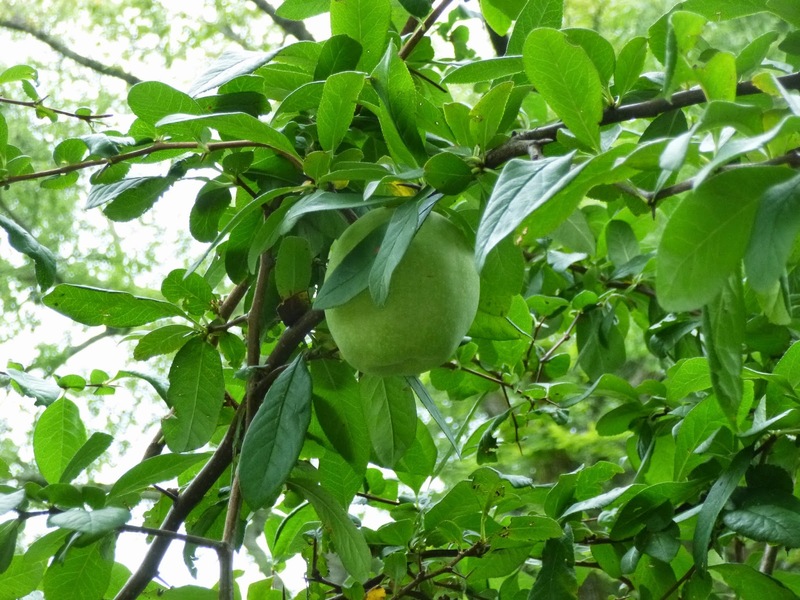 This is an apple-sized fruit on an unnamed hybrid quince (Chaenomeles genus). I've heard good things about Chaenomeles - that it's super tough and able to tolerate heat, cold (to zone 5), drought, wind, etc. 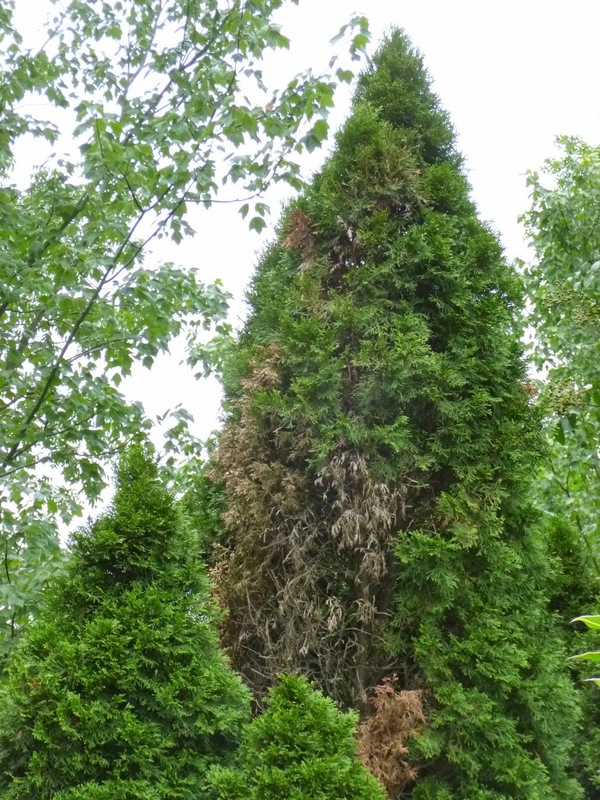 I've also heard that it can be susceptible to fire blight in places like Tennessee that have hot and humid summers. 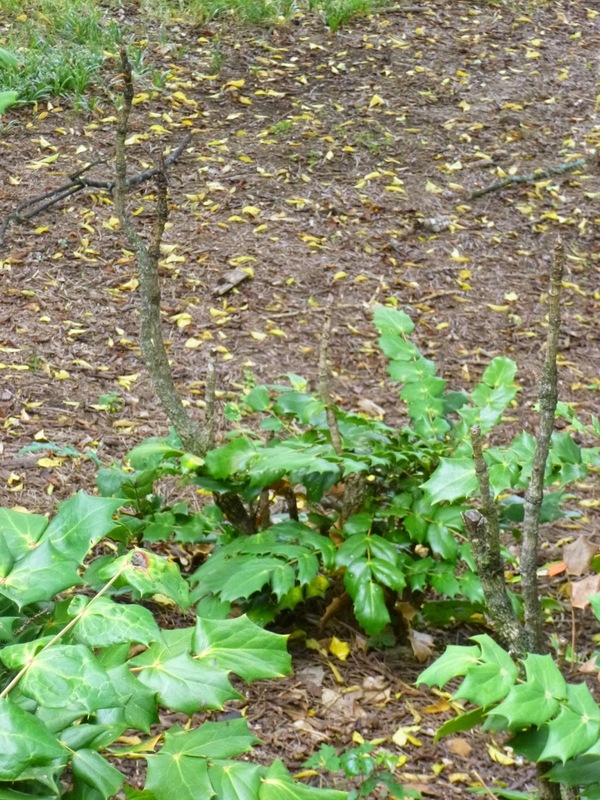 Still, this plant looked large (perhaps 8-10 feet tall) and totally healthy. I may need to give Chaenomeles another look. Plus, the fruit is supposed to be fragrant or even edible when cooked. Oh - but be careful! Chaenomeles can also have some vicious looking long thorns! These are Ginkgo leaves in the foreground, but I really wanted to focus the camera on the tree in the background with the sparse / dying (?) canopy. That's Chamaecyparis obtusa, Hinoki Falsecypress. It does not look happy here. 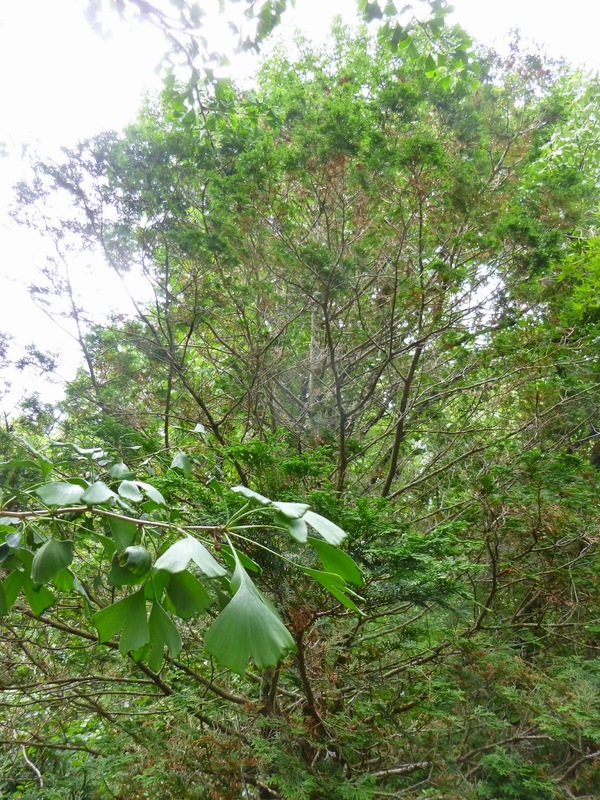 I've heard Hinoki trees have low drought tolerance. Perhaps this tree suffered one drought too many? This is not the summer of the Cicada Invasion - you know, where they swarm in the millions. We had one of those a few years back, thank you very much. But of course there are still a few "off cycle" cicadas out and about. Here's a shell that one of them left attached to a crape myrtle tree. 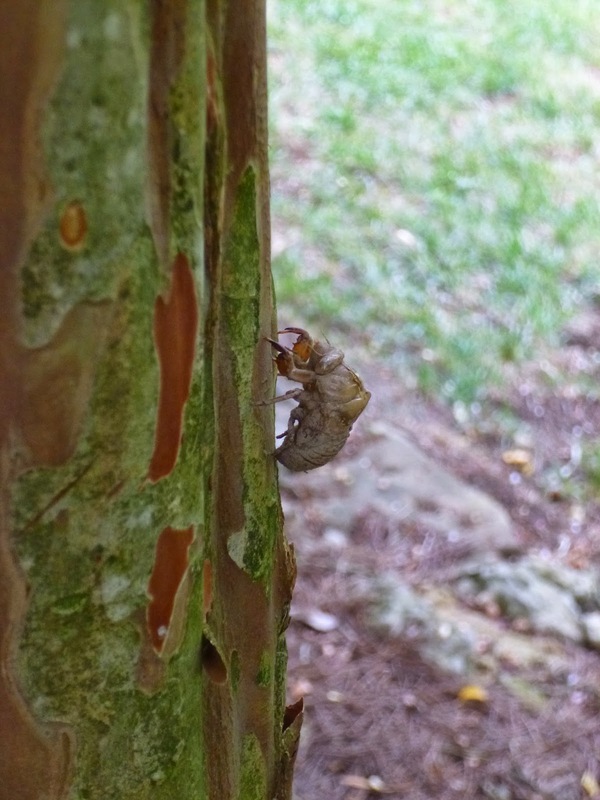 And if you're up for a little insect molting action, you can see some amazing cicada photos here. 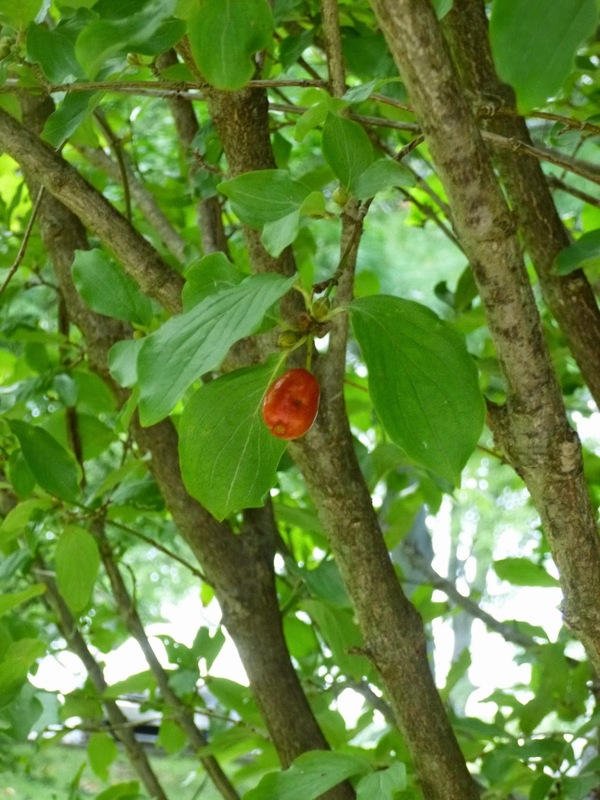 Here's another tree in the dogwood family - Cornus mas or Cornelian Cherry - that is supposed to have edible fruit. And here's a photo of one of these fruits. (I did not try picking and eating it, because I don't know what sort of chemicals (if any) the garden might spray on its plants. And also because I don't know Cheekwood's policies on guests harvesting fruit from its trees. This is a little bit of a worrisome photo for me. 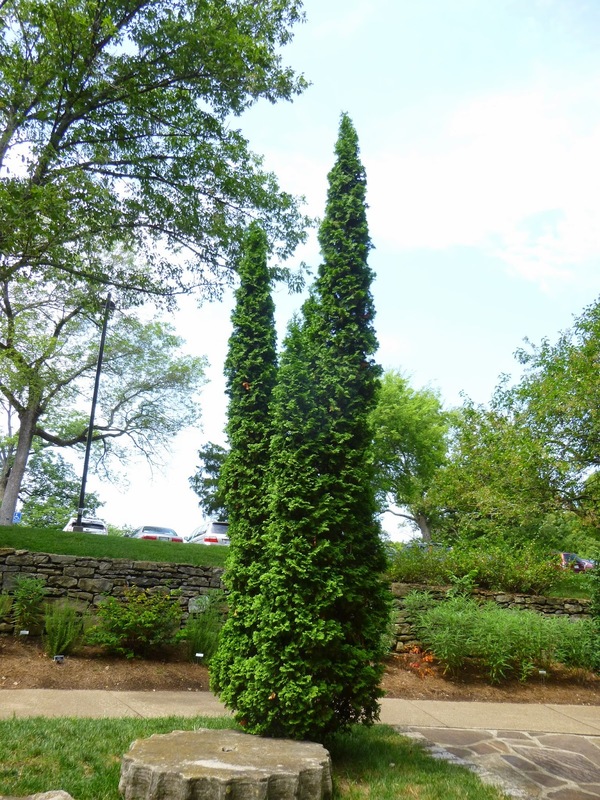 The plant tag identified this as Thuja occidentalis DeGroot's Spire. Why is that an issue? I was under the impressed that DeGroot's Spire stayed super slim and narrow with a single leader. This clearly shows how the plant can birfucate (or trifurcate?) into multiple leaders so that it looks like several plants jammed together. Not awful, but not exactly the look I was seeking when I planted four of them on my front foundation. Ah well, we'll see how mine grow. Or perhaps secondary and tertiary leaders can be pruned off early in the game? 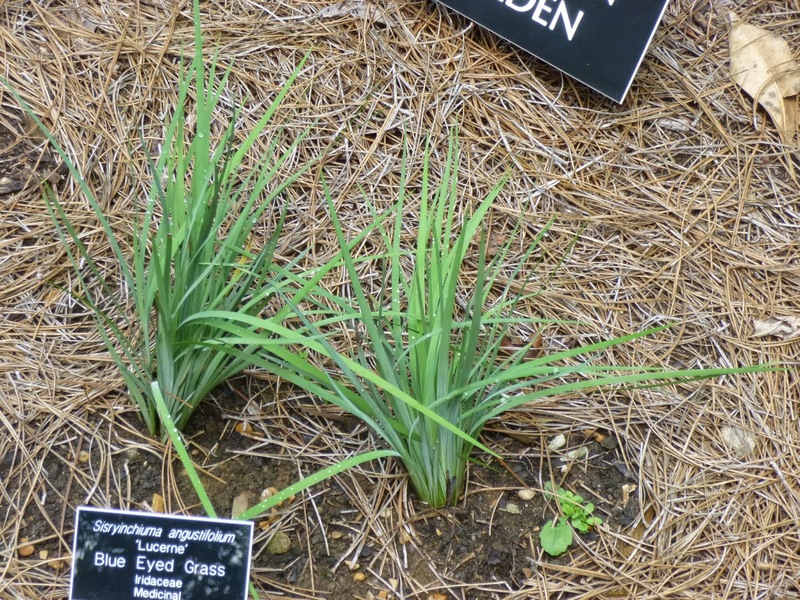 No plant tag here either, but I'm pretty sure this Ophiopogon japonicus Nana, a.k.a. 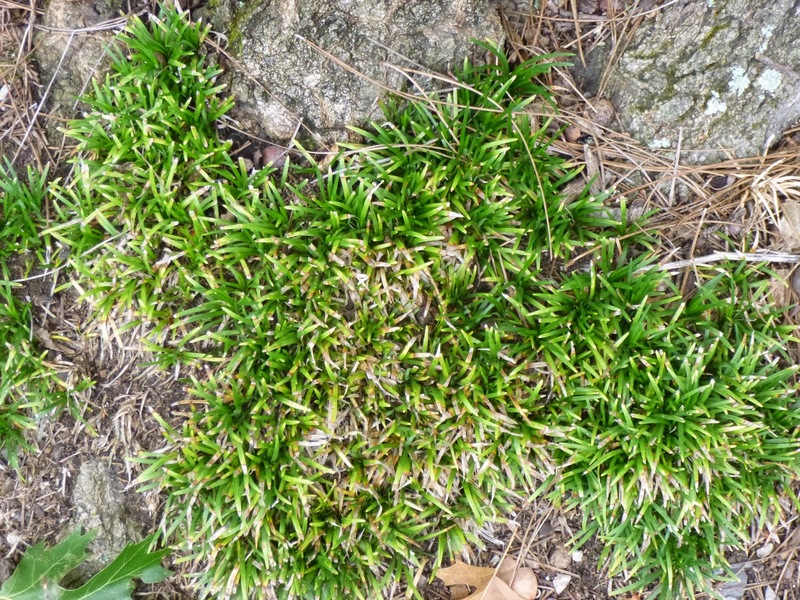 Dwarf Japanese Mondo Grass. One problem I noticed here is that the 'grass' seems so short that weeds might be able to pop up right in the middle. 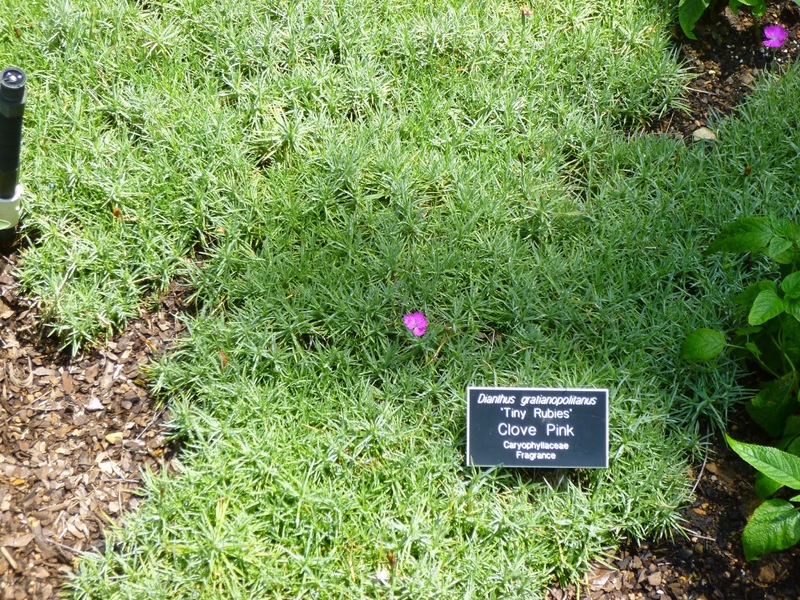 Not a desirable trait in a groundcover. 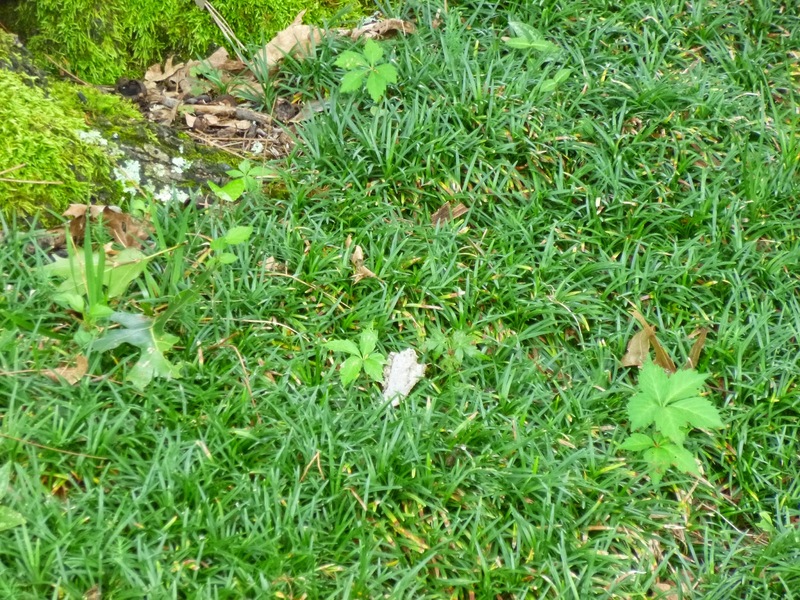 Another obvious problem with Dwarf Japanese Mondo Grass is that a harsh zone 7a winter (or conversely even a warm zone 6b winter) may leave the Ophiopogon with some permanent dead leaves that persist in an unslightly fashion throughout the year. Not a good look. 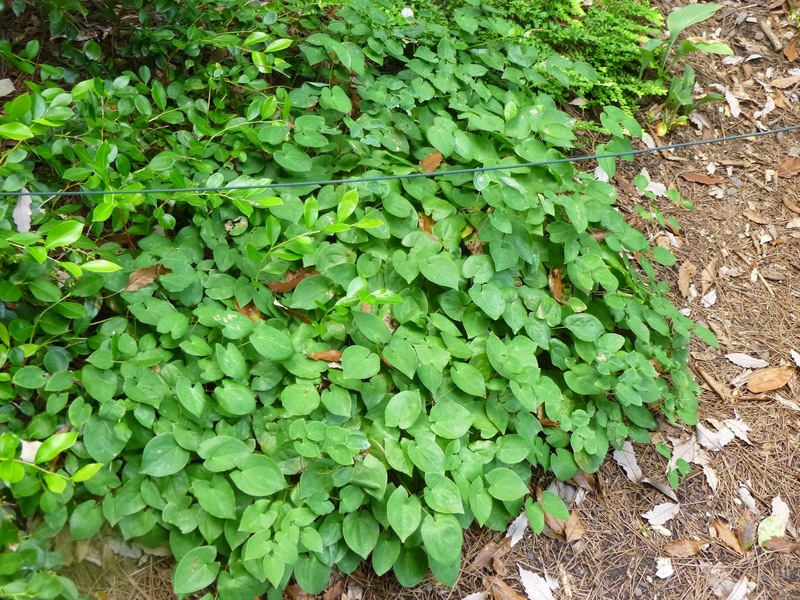 I suspect the plant is best-suited for zone 7b or warmer -- and even then, I'd be a little skeptical about the plant's ability to completely block weeds. Epimedium x versicolor Sulphureum looks like it makes an incredibly lush, thick, healthy groundcover despite last winter's cold and this summer's typical heat and humidity. I've been eyeing this Epimedium for a while and might try adding some to my garden this autumn. A lovely thick patch of Hellebores. 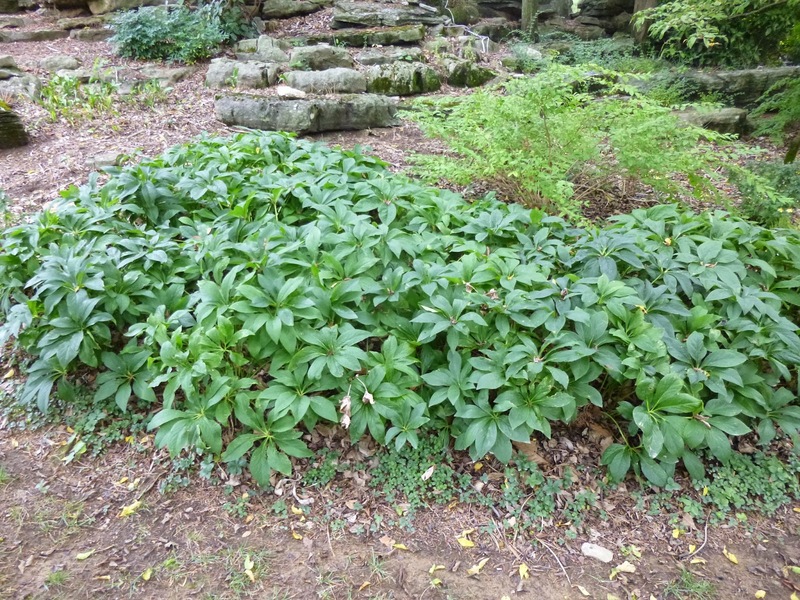 Often praised for their evergreen foliage and winter flowers, you can see that Hellebores can make a nice-looking groundcover even during the dog days of summer. Here's a hops vine that has covered some sort of pillar. It's my understanding that Humulus lupulus, hardy to zone 3, dies back to the roots in the winter, which would mean this is all new growth. It's astoundingly lush and healthy looking, even rampant. Not sure whether it gets any supplemental water. My only concern is that I didn't see much in the way of flowers, it looked like almost all foliage. 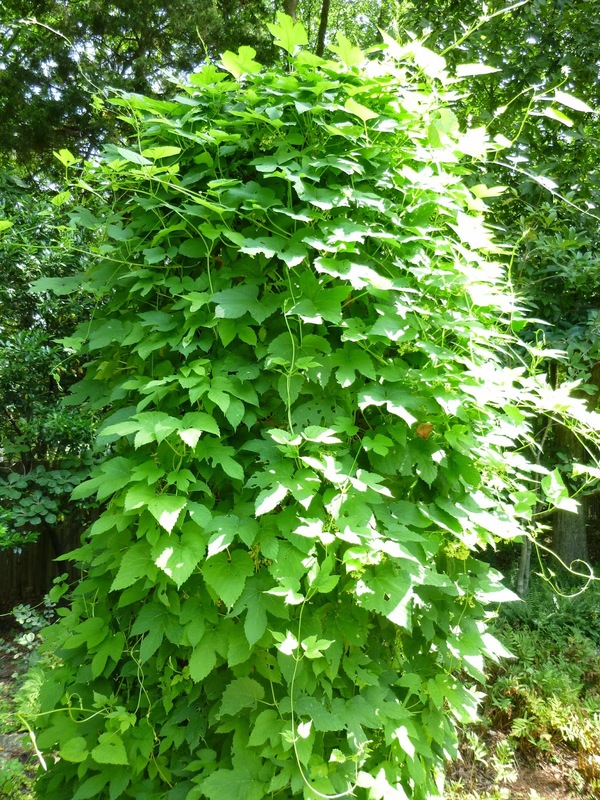 I believe some people grow hops vine as a seasonal screen and I can certainly see how it could serve that purpose. Uh oh. 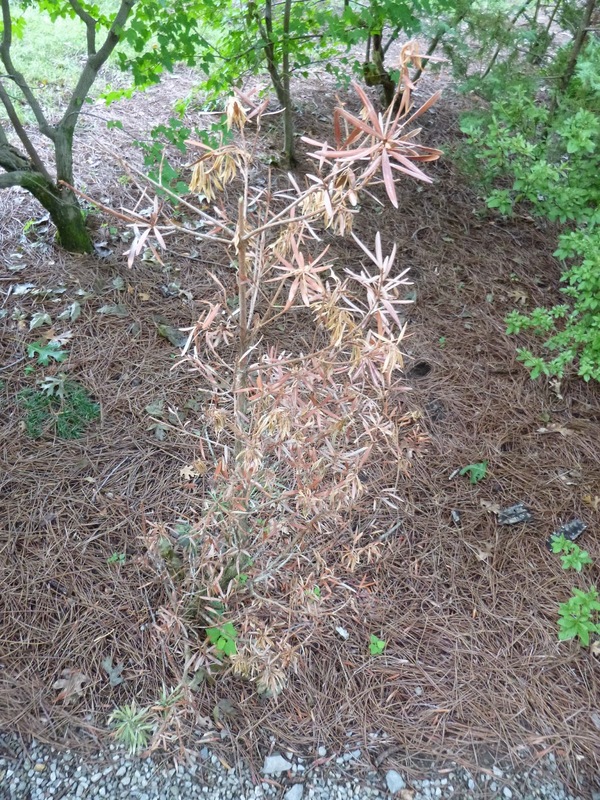 No sign on this one, but from the dead foliage, it looks like it might be Cephalotaxus harringtonia "Fastigiata". Why does that worry me? Because I planted one of these shrubs this past spring. Originally it looked quite healthy, but now a number of the needles are turning brown. I hope it doesn't end up like this specimen! Not sure what's going on with mine (or what happened with this one), because I thought that they were supposed to be quite tough. Lantana camara, no sign, ergo not sure what variety. The colors look different from the Miss Huff variety, which is the one that I'm planning to add to the garden next spring due to its reputed heat tolerance, drought tolerance, ability to attract butterflies (though I didn't see any on this lantana). 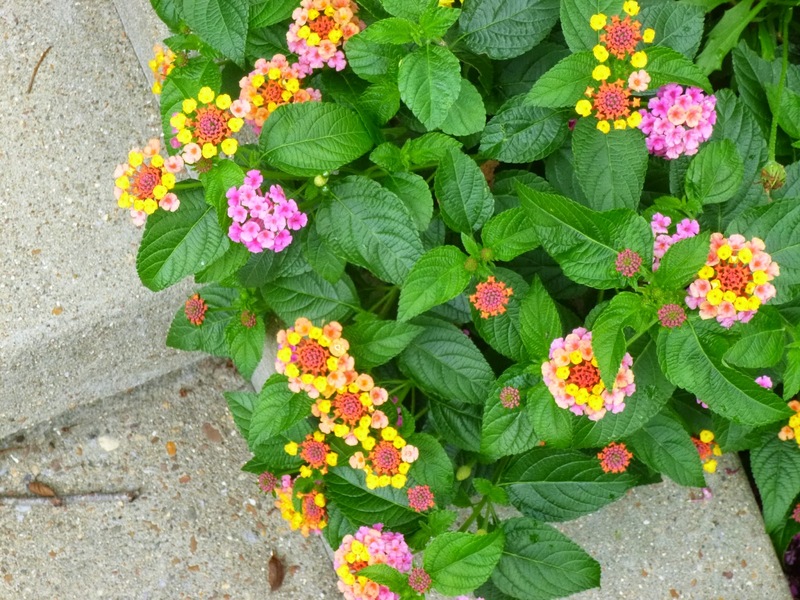 Also, while most lantana are only supposed to be hardy to zones 9-10 and reportedly can be invasive in tropical areas, I understand that Miss Huff may be hardy into zone 7 (ergo it has a chance of behaving like a perennial in Middle Tennessee). Miss Huff is also supposed to be sterile, which should prevent it from becoming a menace in the local wild areas. 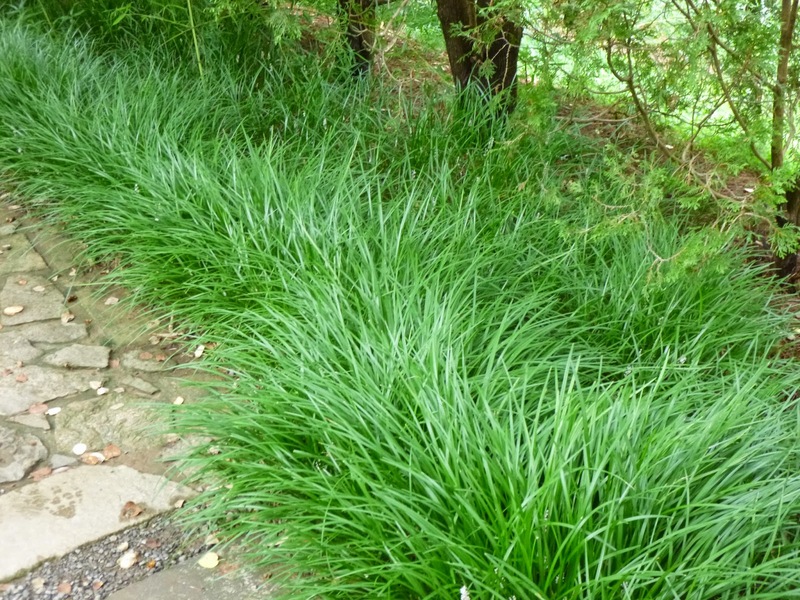 I thought this might be Liriope, but the thin foliage makes me think it could be Ophiopogon japonicus, Monkey Grass. What do you think? 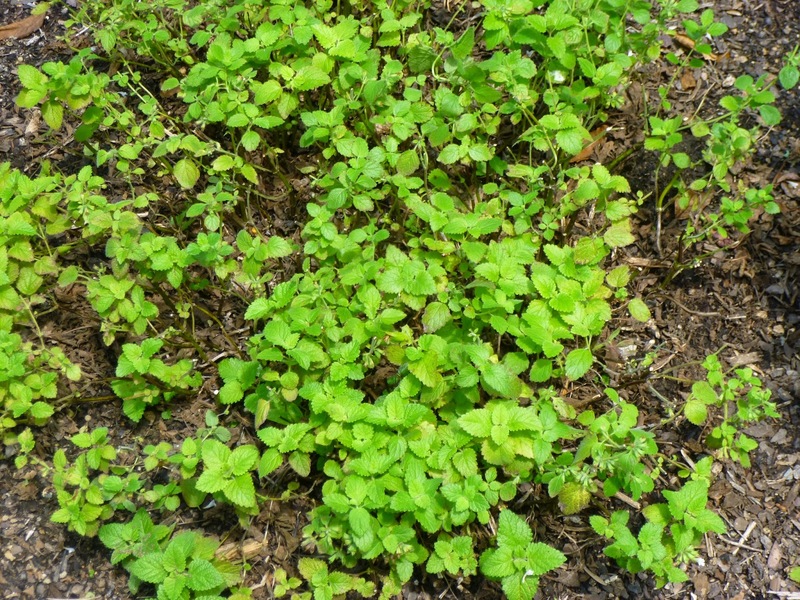 This is Melissa officinalis, a.k.a. Lemon Balm. 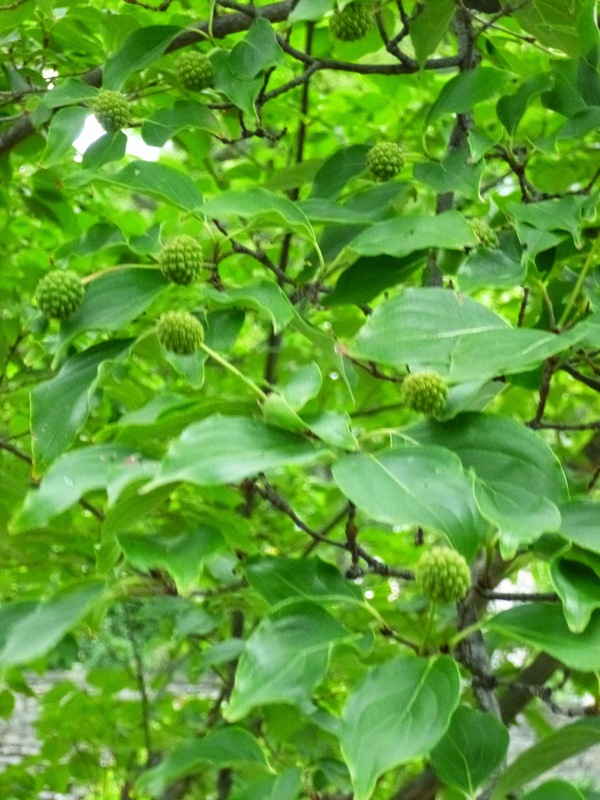 According to the identifying sign, this is a variety called Lime. I've got to say, it seemed rather stressed and stunted by the heat and the mostly sunny setting. 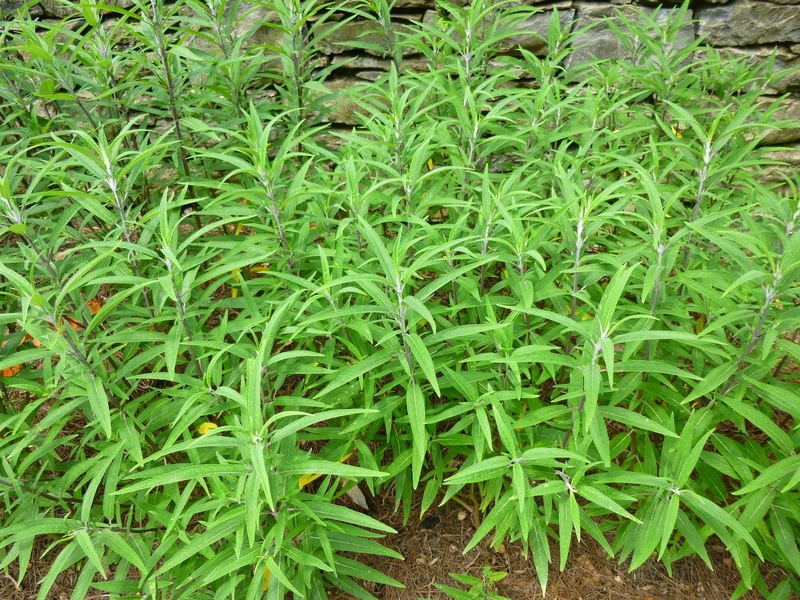 I don't want to brag, but I've got a patch of (spreading) Melissa officinalis in my own garden this seems much happier and healthier in a mostly shady setting. Clearly Cheekwood does not have a rabbit problem. How do I know? 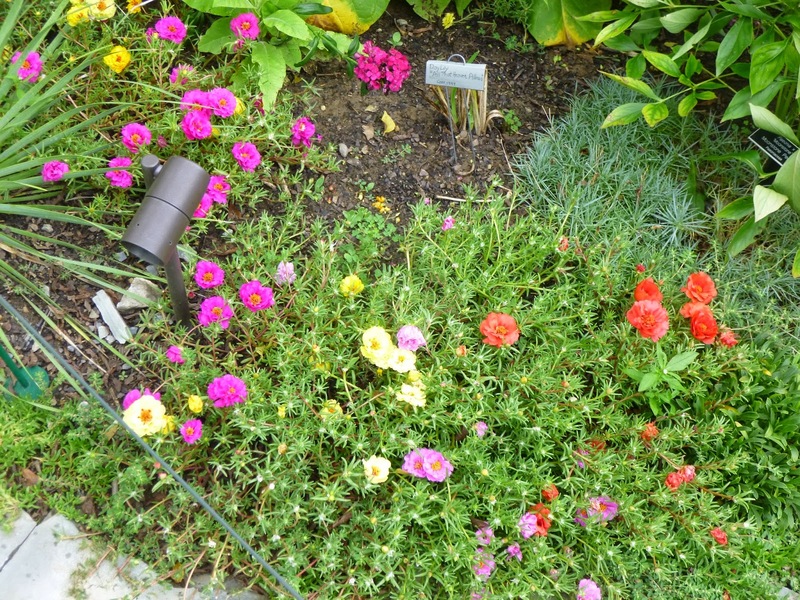 Because this is Portulaca grandiflora, a.k.a. the Moss Rose. I had a (smaller) patch of this in my garden --- until the rabbits (I'm blaming them anyway) nibbled it down to the nubs. It's hanging on, but only as a shadow of its former floriferous self. Wow! 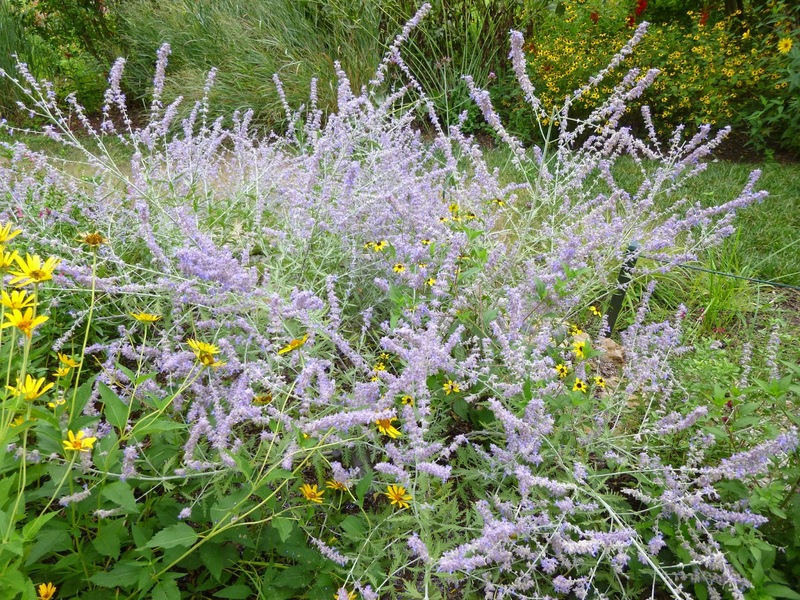 Now this is what Russian Sage should look like! I have a patch that doesn't look nearly as healthy as this. Wish I knew what I'm doing wrong or what Cheekwood is doing right... You can't tell from this photo, by the way, but this probably had more bees visiting than any other plant I saw at Cheekwood during my visit. This is Salvia leucantha, Mexican Bush Sage. Most sources list it as being hardy to zone 8, but Armitage says it could be hardy in zones 6-7. It's supposed to flower from late summer into autumn, so presumably it hasn't started yet. 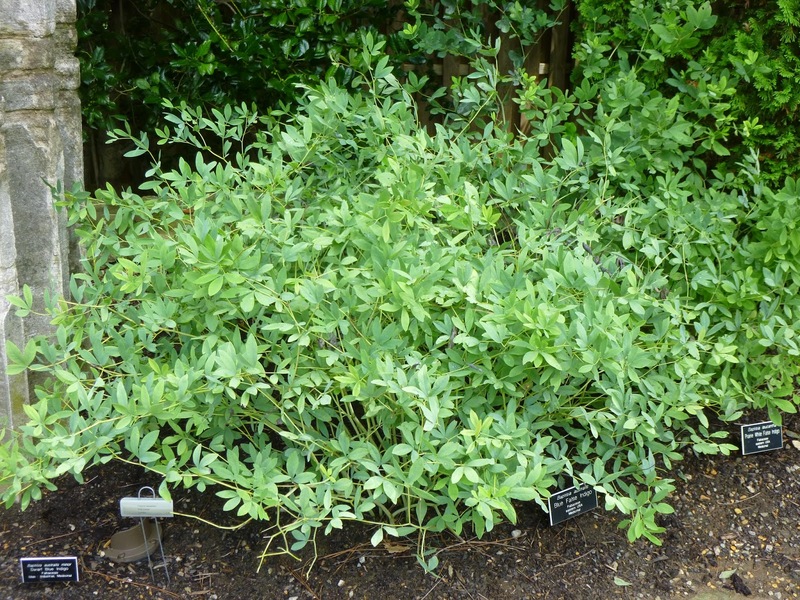 I was just enamored with its healthy-looking elegant grey-green foliage. Finally we have the Chaste Tree - Vitex agnus-castus. It's being grown like a shrub here at Cheekwood. I've heard it likes full sun best (grows faster, has more flowers), but even in a significant amount of shade (as shown here), it seems to be lush, healthy and fairly dense. This is definitely a tough plant. If it had any dieback last winter, you couldn't tell by August. 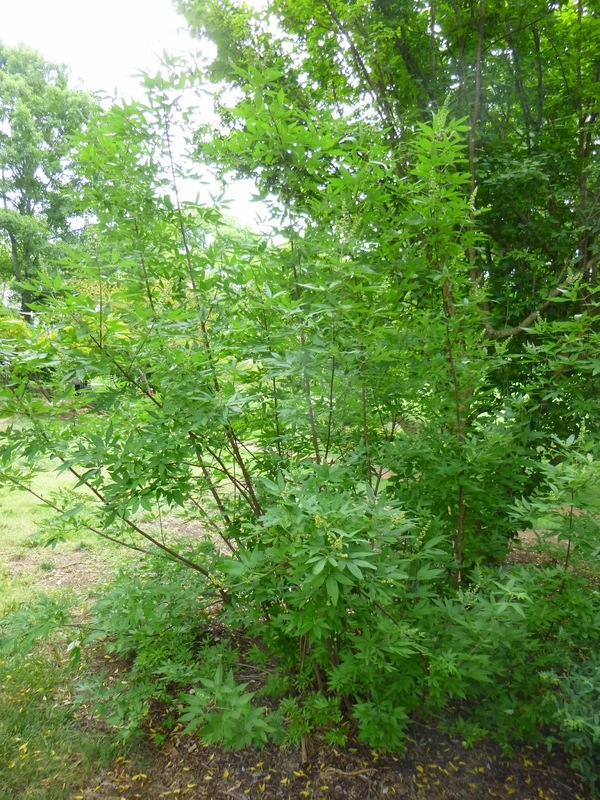 I'm going to say that Vitex agnus-castus is thoroughly hardy in zone 6b. I'm guessing it would survive in zone 6a too, though perhaps as a die-back shrub. And I wonder if anyone has tried it in zone 5?! 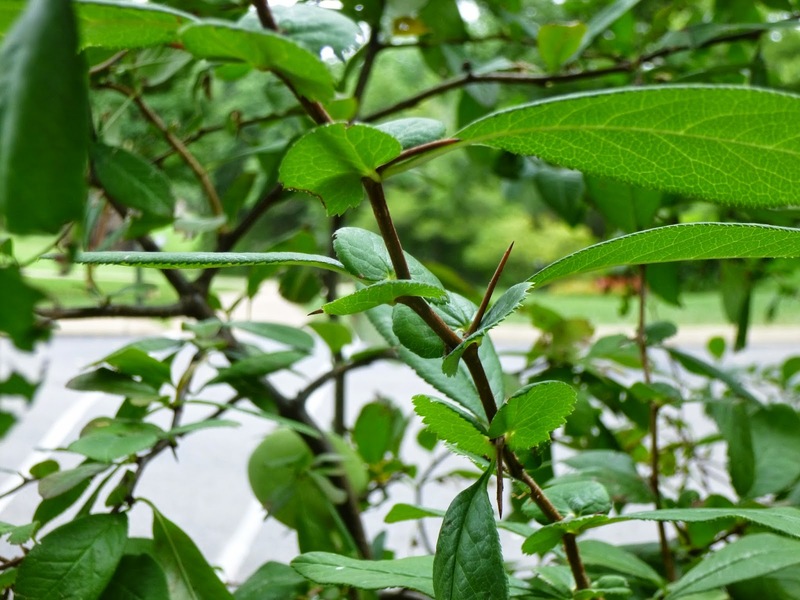 (Warning to zone-pushers, it does leaf out late in the spring even in zone 6b/7a, so I wouldn't give it pride of place in your zone 5-6 garden unless you enjoy looking at bare stems for six months. 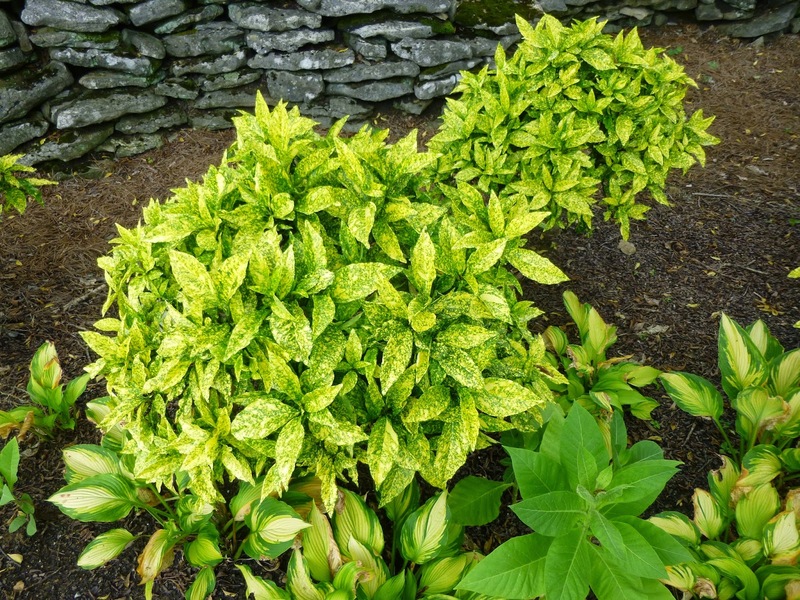 But it could work well in the background or as part of a mixed evergreen-deciduous hedge. I suspect that Vitex agnus-castus truly reveals its full potential in zones 7b-9.